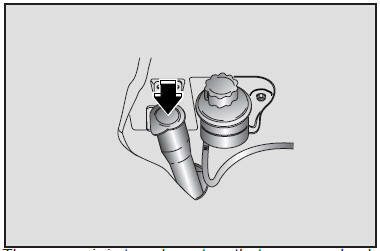 Check the fluid level in the washer fluid reservoir and add fluid if necessary. Plain water may be used if washer fluid is not available. In cold climates, use washer solvent with antifreeze to prevent freezing. Windshield washer fluid agents contain some amounts of alcohol and can be flammable under certain circumstances. Do not allow sparks or flame to contact the washer fluid or the washer fluid reservoir. Damage to the vehicle or it's occupants could occur. All moving points of the body, such as door hinges, hood hinges, and locks, should be lubricated each time the engine oil is changed. Use a non-freezing lubricant on locks during cold weather. Make sure the engine hood secondary latch keeps the hood from opening when the primary latch is released.